Everything in terms of progression in Europe rested on getting a positive result against Cordoba. They had failed to beat them at home but now they had to win away to have any chance of going through. If not, European football would be coming to an end. A win would still leave them a point behind their hosts going into the last round of games and they would still have it all to do but they would have hope. Before the game, Liverpool signed a new forward. Another Frenchman to go along with Damian Diarra. 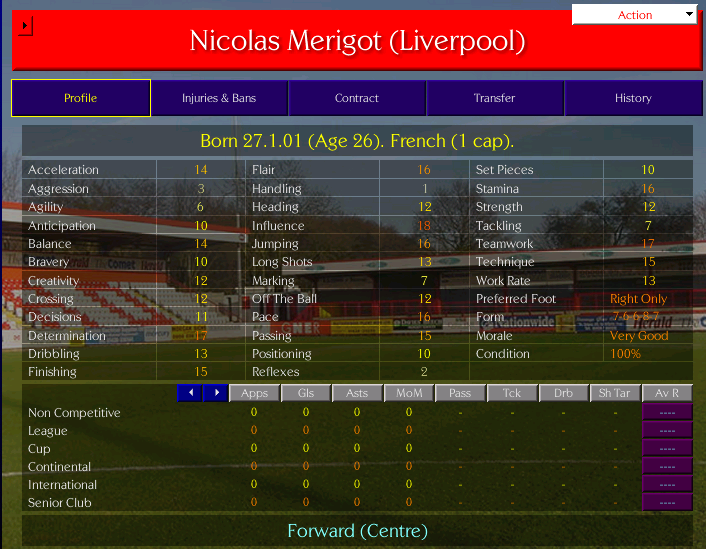 £10.25m was paid to Caen for 26 year old, Nicolas Merigot. This could be seen as a problem for Harry but he was not actually that fussed about this man coming in. That now meant that they had four decent strikers at the club in himself, Merigot, Diarra and Rob Fitzgerald. Jean-Francois Charbonnier could count himself unlucky that he is not grouped in there as well. The new man watched from the stands as Liverpool travelled to Spain for the must win game. It started badly as they fell behind after just 4 minutes and then conceded again on the half hour but over the course of the match they fought back to draw level. A double from Christophe Clement on 32 and 54 minutes gave them a real chance at an extraordinary comeback and possibly even winning the game. That was until Cordoba scored once more with 15 minutes to go to seal the win and take them to the top of the group. It left Liverpool bottom of the group and not actually mathematically out. They would however have to win both remaining games, hope Juve lost both of theirs, overturn the goal difference and hope it doesn't go to head to head. There would be one more match in the month of February. It would be back in league action and one of the most iconic matches in English football. Liverpool would travel along the M62 to Old Trafford. It was Manchester United vs Liverpool. Historically, the Manchester team had the advantage with 16 wins to 10 in the 37 matches so far. But Liverpool had won the last four, a run stretching back to October 2024, over two and a half years before. Always hotly contested, this one was no different and the touch paper was lit after just three minutes when Christophe Clement scored to put Liverpool ahead. Liverpool would stay top as it stood but, just when it looked as though they would escape with all three points, the home team managed to pop up with an equaliser just 15 minutes from tie to make it all square and it would be a point each and honours even. That meant that Liverpool did indeed stay top but only on goal difference ahead of Birmingham but 24 hours, Arsenal won their game in hand 1-0 away to Leeds to take them to the summit of the table. Everything was so tight. Just 6 points separated the top 7 in the division. One slip up could lead to a team dropping out of it. Going on a run of wins to take a team ahead of the pack. Going into March, it really was all to play for. Sounds like they're buggared in the CL! March was going to be pivotal for finding out what success would be coming towards Anfield at seasons end. There would be six games in the month. Games against Aston Villa would bookend the month.Three of games would come in the first nine days of it. The matches included a League Cup Semi Final second leg and the final two Champions League Phase 2 games. Mixed in with those would be three league encounters as well. Every one of the games was going to be vitally important if they wanted to win any silverware come the end of the season. The month started with a visit to Villa Park and trying to keep a hold of the 1-0 advantage they had from the first leg. A trip to Wembley was the prize if they were able to prevail and spirits were high in the camp. Harry was happy as well. Despite the arrival of Nicolas Merigot at the club, he still felt he had enough about him to prove he was the main man and keep his place up front. As it was, they actually lined up together for the game so Harry had a new man up alongside him to get used to. He'd seen little bits of him whilst he was playing for Caen and he knew he was an out and out striker, having scored 18 or more goals for the last four seasons. So Harry figured in the long run, he may be dropping deeper to accomodate if and when they played together in the future. But for today they were a two pronged attack. Ian Holloway clearly wanted to grab a quick goal and try and kill off the tie. They got it. Centre half Gary Gray headed home a corner to double the aggregate lead after 17 minutes and they needed do no more. 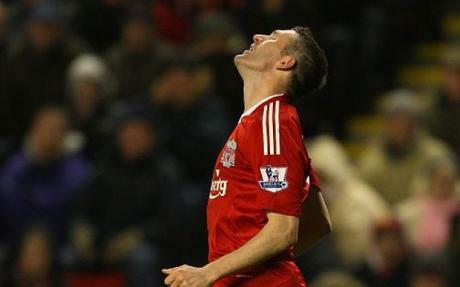 Villa grabbed a goal in second half injury time but it was too late and Liverpool were through 2-1. So a Wembley Final beckoned but they were still fighting on two other fronts and it was league action next as Liverpool hosted Tottenham Hotspur. Liverpool needed a win to keep up pressure on all of those around them. With Spurs down in 12th, it should have been a straight forward win. And so it proved. Merigot got his first goal for the club and three minutes later, Harry grabbed his 32nd of the season in all competitions to double the lead. They added a third on the half hour to take the game and seal the three points. That result put Liverpool back on top of the table but they wouldn't play another league game for 14 days. In between would be two Champions League games. Liverpool needed to win both and Juventus had to lose both for them to have any chance of going through. It was out of their hands but they could only do what they could do and that was win and home to Lille. Ian Lee was Harry's partner for the game as Merigot was cup tied. They were on a hiding to nothing really but all Harry wanted was for the team to play with pride and show that they were made of sterner stuff than they had showed for the first 4 games of the group. They started strongly and took the lead after 13 minutes and they doubled that on the half hour when Harry grabbed Liverpool's second. Everything was going there way as well as Juventus were trailing at the break as well. And that's how it stayed. And so it would go to the final matchday. Cordoba had qualified with a game to spare on 11 points. Juve still in second on 7 points, Lille were third on 6 and Liverpool, still bottom, but still with a slim chance, on 4. It still looked beyond them. Juve needed just a point. Cordoba would have to beat Lille and Liverpool would have to beat the mighty Juventus, away, and overturn a goal difference deficit to have any chance of doing the impossible. 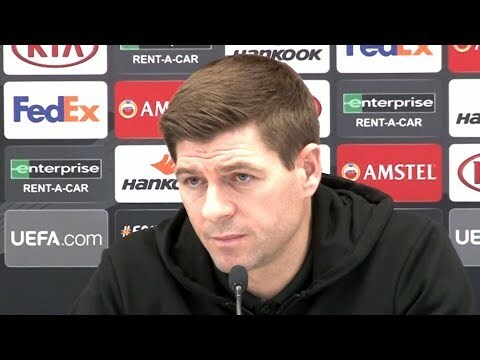 The question was put to Harry in the press conference after the win over Lille. He was of course bullish and said all the right things for the cameras and for the journalists but even he knew that if they were to make it, it would be a turnaround almost on a par to when the club won the whole thing back in 2005. Wow, didn't realise Harry had scored so many goals this season! 32 by March, great stuff. A good little run being formed here. Can they really beat the Old Lady? I think it could be one step too far but hopefully they'll give them a run for their money! 18 in 24 in the League. 7 in 7 in the Cups. 8 in 11 in Europe. He's also got 3 in 5 for England as well so he's definately still got it. It'll be interesting to see what happens when Diarra comes back from injury, as Diarra, Bow and Merigot do not go into 2 forward spots. Quite a few different perumations could happen on Matchday 6. Juventus had beaten Liverpool 2-0 in the reverse fixture earlier in the group so Liverpool needed a win by three clear goals to advance. They also needed Cordoba to beat Lille to confirm their passage to the knockout rounds. Liverpool could probably get away with a draw in the other fixture as well but that would then complicated things even further as, if Liverpool were to win, all three sides would be on 7 points. Lille had beaten Liverpool 2-0, Liverpool had beaten Lille 2-0, Lille beat Juve 2-1 but also lost 2-0 to them. It looked like it was an absolute lottery as to who would go through with Cordoba. All these scenarios of course could only happen if Liverpool won. Holloway picked a good side. Damian Diarra was back fully fit just in time for the game and was selected to play up front alongside Harry. Despite playing away, he chose an attacking 4-4-2 formation with attacking wingers. They had to go for it. Captain Steve Graham summed it best in the dressing room just before the players went out onto the field. "We are on a hiding to nothing here. Everything is against us but all we can do is do go out there and win. It doesn't matter how we do it, we just have to do what we need to do and hope the stars align. So let's get out there and win. Let's get out there and make Liverpool proud, playing great football and enjoying ourselves. If we enjoy ourselves, we play better, if we play better we win. Let's go win this!" Harry agreed. Clapping his hands and banging on the walls of the away changing room, he was ready. Liverpool were ready. Juventus must have heard the rowdy nature of their opponents as they went out. But they knew what they needed to do to go through as well. It was going to be an interesting encounter. Liverpool started brightly. They were clearly up for it. They were very quick out of the blocks and had had a number of shots on goal before five minutes were even on the clock. They made the breakthrough after just 8. A short throw in on the left was collected by Diarra who passed it simply inside to Harry. He was surprised that he was allowed to collect it and have time to turn to face goal without a tackle coming in or anyone being anywhere near him to pressure him. He didn't need a second invitation. He breezed past the centre back back who belatedly came to close him down and struck a left foot shot across the keeper and into the far bottom corner. They had the lead and Harry celebrated before running into the net to collect the ball. They were hungry and they wanted more. It was one way traffic. Diarra crashed a volley off the bar, Alex Wynter had a shot saved, Nassim Joinville's cross come shot nearly caught the keeper out who had to tip over. But in the 17th minute, the lead was doubled. And it was simple. Harry dropped deep to receive the ball and again was allowed the time and space to turn. Once again he made them pay as he chipped a ball ahead into space for Diarra to run onto. One touch to control and a second to slot it through the keepers legs and into the net. 2-0. Cruising. But again, more was needed. A third would kill off the tie and possibly get Liverpool into second. They continued to knock on the door but could not be further rewarded. Frustration in the crowd was rife but the players knew they were doing all they could. Ten minutes before half time though. They were deflated. News came in that Lille had taken the lead at home to Cordoba. Cordoba, with nothing to play for, had no reason to attack and drag back into that game. With all the professionalism in the world, the Liverpool players knew that was that. There was literally no way that the Spainish side were going to attack enough to score two goals to win the game when they didn't need to exert themselves. And so it came to be. Liverpool continued to press but could not find a third. They won 2-0. But in France, Lille also won and with that finished 2nd and progressed out of the group. Without that third goal, Liverpool finished bottom. Always gonna be a big ask to qualify if you're relying on other results. Lessons to be learnt in getting games won early in the group! So, the European dream was over but Liverpool were still fighting on two fronts. They were still very much in the title hunt as they sat top of the table and at the start of April they would be contesting the League Cup Final against Birmingham City. That match was still three weeks away though and there would be two very important league matches to come before then. The first of those taking them on a trip to London and Craven Cottage to take on Fulham. They would be no pushovers as they were currently riding high in 7th and had designs on making it into the European places. In fact, this would be the 40th encounter between the two since Harry had first become a footballer and Fulham actually had the advantage winning 14 to Liverpool's 10. The stats for games played at The Cottage were even more damning. 19 games had been played. Liverpool had won just ONE. And that win had come way back in 2013. Harry was just entering his third season at Colchester when that happened. The omens were not good. But if Liverpool had any designs on the title, then they had to take something from the game. They may have been top but Birmingham, the opponents in the upcoming Final were breathing down their necks being just a point behind, although they had played a game more. Arsenal however were third, just two points behind Liverpool but with the advantage of having a game in hand over them. West Brom and both Manchester clubs were also in close attendance and just 5 points separated the top 6. Things got even worse when it was confirmed that Damien Diarra had picked up another injury on his return from his last one. He picked up a chest injury in the game against Juve and would be out for two weeks. With Robert Fitzgerald already out for 2 months with shin splints, this left them very light up top. Right winger Christophe Clement and centre back Gary Gray were also out and the task looked insurmountable. It obviously meant that Harry would be paired with Nicolas Merigot for a game that nobody thought Liverpool could win. Not even their fans. They travelled to London in hope more than expectation and they were unusually quiet as the game kicked off. That apprehension filtered down to the players and they made a very nervous start, with passes going astray and not being able to get into any kind of rhythm. It was all Fulham in the first 15 minutes. Soon after, Liverpool made a rare breakaway and managed to get off a shot. It was a poor one by Merigot which looked like it was going wide but the Fulham keeper pushed it behind just to be on the safe side. From Soda's corner, Harry rose highest to flick a header at goal which was parried by the keeper but it fell to the feet of Anthony Gibson who poked home in the six yard box to take the lead. Even after scoring, Liverpool still were not able to take the ascendancy and boss the game and it was only due to poor finishing from Fulham that they went in at half time with their lead. Even though his team had the lead, Ian Holloway was furious. He spent the full 15 minute break ripping into his players, telling them that on that display, they were not fit to wear the shirt, that they didn't deserve to be paid for that performance and n no uncertain terms that he was giving them 45 minutes to save themselves in the team. Harry agreed. Even though he was one of the team, he wasn't able to play to the best of his ability either. Everyone seemed off colour, he wasn't sure they but they had to pull out a performance in the second half if they wanted to keep their place, especially with a cup final on the horizon. The rocket that Holloway lit under them certainly sparked, and it sparked quickly in the second half. Just 4 minutes into it, Nassim Joinville passed inside to Merigot who lifted the ball over the top of the centre back to where he hoped Harry had made a run. He was not disappointed and as the keeper advanced to narrow the angle, Bow lifted the bouncing ball over him to lob it into the net. The lead doubled and now Liverpool believed. They really believed that they were going to be the team that broke the 14 year long record of failure to win at Craven Cottage. They didn't make it easy for themselves though as they conceded a goal to halve the deficit on 62 minutes. Less than a minute later though, they had their two goal cushion back and were playing against a team with ten men. As Ramon Azziz passed inside to Nassim Joinville, Joinville was barged off the ball by a Fulham midfielder. Possibly intentionally, possibly not, his elbow made contact with Joinville's jaw and it was an instant decision from the referee to pull out the red card. The young 18 year old player was aghast and beside himself. Harry could instantly see it was youthful exuberance from the 18 year old who had seen his side get back into the game and wanted to win back the ball. He ran over and put an arm round him. "Don't worry mate. I know you didn't mean to injure him. Just get yourself off. Don't get yourself in more trouble by not going." It was clever from Bow. It was the mark of the England captain. He knew what it was like to be young and trying to make a mark on the game. But the card could not be reversed so he left him to trudge off and made his way over to where the free kick would be taken. It was within range. Slightly to the right of the D, about 25 yards out. He stood one side of the ball, left footer Diego Soda the other, but there was only going to be one man who was taking it. As Joinville walked off after receiving treatment, ready to come back on, Harry methodically took three very pronounced steps back to find his starting spot for his free kick routine. He took a deep breath and as the ref blew the whistle, he ran up and aimed for the far corner. It wasn't one f his best if he was honest but it looked as though it would be on target as it rose to go over the wall. As it reached the wall, the man on the far end jumped and it hit him on the shoulder, completly changing the direction of the ball, leaving the keeper flat footed before creeping in the near post. The away fans celebrated, Harry looked sheepish as he knew he had got more from the attempt than maybe he should have but he didn't care. A bit of luck goes a long way. Liverpool grabbed a little more luck before the end as they were given a soft looking penalty that was put away by Ade Scott. They didn't mind though. They had won, and won comfortably and did so by not playing that well. Some say that is the mark of champions. It remained to be seen. Their next game saw them back at home and taking on Aston Villa. Another side in the top half of the table but this time, Liverpool were on home turf. They were confident. Holloway rewarded the team for stepping up against Fulham by naming the same side. They started well and were looking to dictate the play but Villa had come with a game plan. And that was to disrupt the play whenever they could. Not allow Liverpool to play. They would live on the edge of the laws, little shirt pulls, nudges, off the ball comings-together. It was a clever plan. They were not going as far as to commit outright fouls, although a few free kicks were given but they were being sly and leaving their mark in places that the referee couldn't see. It disrupted the play so much that there was not a single shot on goal in the whole first half. Villa continued to play the disruptive game in the second half but also had an emphasis on attack as well. And they got their goal on 51 minutes when they broke clear down the right and crossed to the edge of the box for an onrushing midfielder to volley home. They they doubled their lead ten minutes later in similar fashion. Again down the right, a long deep cross came in which was headed out but it fell to the feet of a Villa man who picked his spot past Steve Graham. By this time, both Harry and Merigot had been replaced as they had been battered and bruised by the opposition centre halves. Knees to the back of the thigh, little kicks to the ankle, standing on feet, they had been through it all but all had gone unpunished by the ref who was oblivious to what had happened. That meant there were two rookies playing up front. Iain Lee, 21 was very much a back up player and had never really been able to nail down a decent run in the team since he had joined, ironically from Aston Villa. He was paired with Bobby Middleton, a raw 19 year old who was still trying to make his way in the game. He was probably more of an attacking midfielder than a centre forward but he was thrown on anyway. Liverpool rallied and did pull one back on 71 minutes through Ade Scott's second in two games but as they chased the game, inevitably gaps would be left at the back and with four minutes to go, Villa came forward with a 4 on 3 situation and made no mistake to give themselves breathing space. There was still time, a minute from the end for Middleton to grab his first career goal but his celebrations were muted as the game was done and a vital three points had slipped away. Next up, Liverpool would be facing Villa's city rivals, Birmingham City. In the League Cup Final. But first, Harry had a European Championship qualifier with England against Romania just 4 days before. 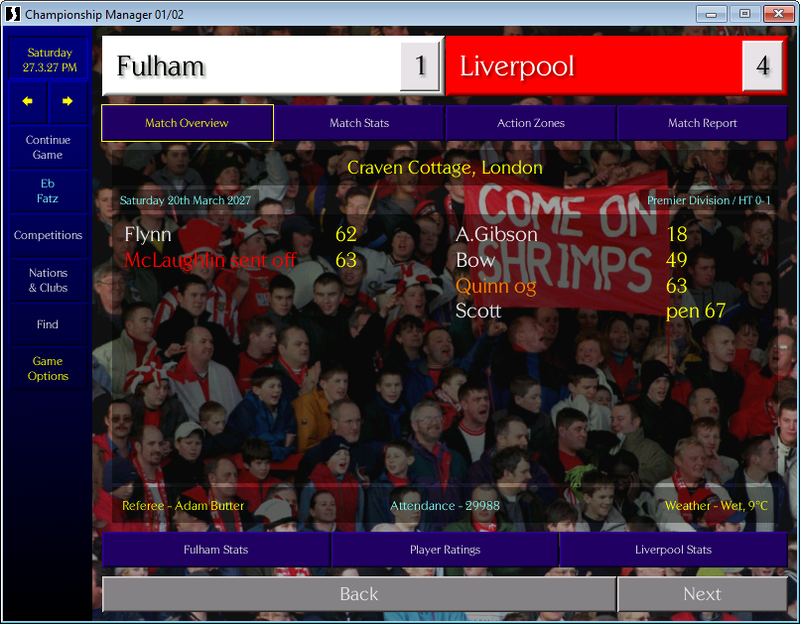 14 years without a win at Fulham Some record! It's like the old Newcastle record when they could never win in London. England would be facing Romania as they tried to make their way back to the top of the qualifying group, Turkey had played a few days before and had gone above them and now England had a chance to return the favour. They were still playing the unconventional sweeper formation. The manager still hadn't got the message that there were no Englishmen who actually play as a sweeper in this day and age but Harry and his team had to just get on with it and make the best of it. Even so, England should have had enough about them to be able to get a result. A first cap was handed to 27 year old Tony Osborne in midfield. And Harry was paired in attack with Danny Lewis, who interestingly, would be on the opposition when the League Cup Final came round in a few days. The rest of the side almost picked itself really. Neil Rutherford would play as the sweeper. Harry's Liverpool teammate Ade Scott would be one of the centre backs, it was probably only Martin Johnston (Joe Cole regen) who would be unhappy about losing his place to the new debutant. Regardless of the formation, England were confident they would be able to dispatch Romania comfortably and it proved so as Danny Lewi grabbed a first half brace to put England in control. It was inevitable that Captain Bow would get himself on the scoresheet as well for his 44th England goal as they strolled to a 3-0 win and return to the top of the group. Georgia also won to stay on the same points as England and of course Turkey could leapfrog them both if they won their game in hand. The group was proving more taxing than England had hoped. And it was on to the League Cup Final. Harry had played at Wembley more times than he cared to remember. Not least just three days before. 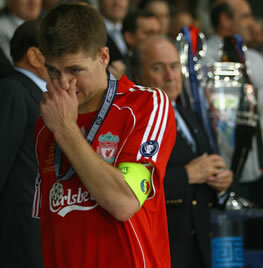 He had walked out as captain at the stadium a number of times as well but this time it was for a cup final. Everyone wants to play in a domestic final at Wembley. It's a dream for players up and down the land, professional or not. And this would be his first League Cup Final. It had been a long time coming. Yes, he had played overseas for a large proportion of his career but he had spent time at Colchester and Chelsea before this so for this to be his first final was a bit of a shock. He was pleased to have got there and would be doing his utmost to make it count to bring home the trophy. There was big build up in Liverpool in the week before the game. Red bunting flew in all the places around the ground, it was even seen in places that were generally seen as Everton strongholds. Liverpool the club were enjoying being back at the upper echelons of the domestic game after seeing themselves relegated to mid table also-rans for a lot of their most recent history. Before winning the league last season, they had finished 9th, 12th and 12th in the three seasons before that. They had reached the 2019 League Cup Final but had only made one semi final in the 10 years since until this one, the FA Cup was similar, they had had one good run in 2025 and won it but hadn't made it to the semis in any year other than that since 2010. They seemed to be back in the big time now though, winning the league and in the running for this season and of course in this final. A potential double was on the cards if they could secure this final. Of course, their opponents, Birmingham City, would be thinking exactly the same thing. They were just one point behind Liverpool in the league so they had just as much chance of completing their own double than Liverpool doing it. It would certainly be an interesting Final. Many times in the past, the Final had been a mismatch. Because so many of the sides at the top end of the table played weakened sides, some unusual teams had made the final in the past meaning that one side would go into it as heavy favourites. This one was the complete opposite. No one could choose the winner from the two and it had all the hallmarks of a classic. Ian Holloway decided that Damian Diarra, still officially on the shelf according to the clubs physios, was fit enough for the bench. That meant that there was no change up front as Harry was paired with Merigot. Mattia Pastore started in central midfield as well despite asking to go on the transfer list and already agreeing a summer move back to Parma in his homeland. Surprisingly, Diego Soda was dropped from left back as well. Ade Scott was pushed out to left back to cover. It certainly was an interesting choice from Holloway. Soda had been playing well all season so it was very much a surprise. The teams were read out on the PA system 20 minutes before kick off and the Liverpool fans were as dumbfounded as the pundits covering the game. Holloway obviously had a plan, the players just had to trust he knew what he was doing. Things paid off pretty quickly as the 12th minute as a long ball forward was flicked on by Merigot for Harry to run onto. He opened up his body as if to curl it round the keeper before faking and going round him to pass it into the empty net. The perfect start. Harry ran towards the Liverpool fans and stood before them, arms outstretched, soaking up their adulation. He felt more at home now in the red of Liverpool as he probably had anywhere in his career. As his teammates engulfed him, a seriousness came over him. He shouted at them. "Keep your heads now. This is far from over. So much more of this game to play. This is not won yet!" He was right. Only 12 minutes had past. There was so much more of the game to play. 78 minutes to either hold out or go for more. Liverpool were not the team to sit on a lead. By half time, they had not added to their lead but Birmingham had yet to register a shot on goal. Liverpool were in control. That changed 9 minutes into the second half as, against the run of play, Birmingham managed to keep hold of the ball for a period and work themselves an opening. It made it's way to the centre forward. As Steve Graham in the Liverpool goal came out to try and narrow the angle, he slipped and couldn't get set before the shot came in and it went past him and into the net. They weren't level for long. Five minutes later. Christophe Clement went free down the right to cross for Merigot who swung wildly and completely missed the ball, this meant the centre back who was behind him was not ready and let the ball past him as well. It fell right into the path of Bow who took a touch to control and passed the ball back into the opposite corner for Liverpool to retake the lead. Birmingham threw everything at it to get back into it. Going into the last 5 minutes, both of their centre backs were permanently stationed up front and they were pumping balls into the Liverpool box. attack after attack was repelled. With a minute to go, another cross bobbled about in the box before being hoofed clear and with so many forward, it flew ahead of Merigot in acres of space. He ran through from his own half without an opponent anywhere near him and with time to set himself and only the keeper to beat, he slipped the ball under him and into the net. Off came his shirt and he was swinging it wildly above his head as his teammates finally caught up with him to drag him to the ground and celebrate. The subs were on the pitch, Holloway was running up and down the technical area in delight. They knew that was it, there was no way back now. The last minute was played out plus two minutes of injury time and as the final whistle blew, Harry slumped to the ground exhausted but elated. He'd done it, he'd won a domestic cup trophy, he was an English League Cup Winner. 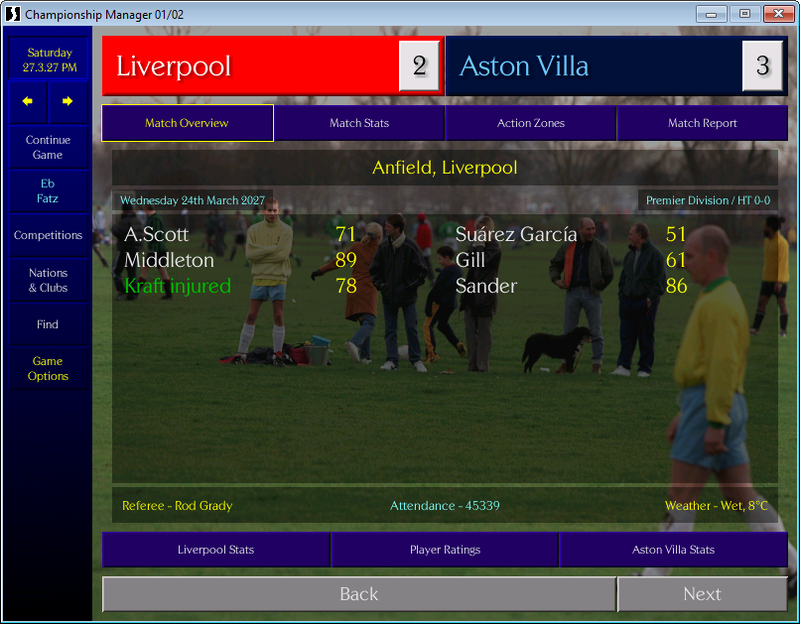 A first ever League Cup final, wow! Great to see he was the star of the show with two goals and he was right to tell his teammates to keep their heads! PS - Harry to reach 50 England goals before long! There was no time to enjoy celebrating winning the Final. Liverpool had three vital league matches coming up in the 13 days after the game. One just three days after in fact and that was a home tie against Huddersfield Town. It was the virtually the best fixture they could have hoped for really with Huddersfield sitting second bottom and six points adrift from safety. They were not a great side but, they would be fighting for their lives and that could cause some issues. Liverpool would need to be on their game to make sure their were no slip ups. Harry lined up alongside Damien Diarra who was restored to the starting line up and Ian Holloway was hoping that these two would fire them to victory to keep the pressure on Arsenal. Diego Soda also returned so his absence against Birmingham in the League Cup Final was even more unexplained. Huddersfield, if they were going to fight, had all the fight knocked out of them after just 7 minutes of the match. Ivan Garcia Ramos, the Spanish centre back, rose highest to nod home a flicked on corner. Four minutes later, in the 7th minute, the lead was doubled. Another corner, another flick on but this time it was Harry on the end of it to poke home from no more than 2 yards out. An amazing start to the game which allowed Liverpool to take their foot off the gas a little. They needed do no more and the game played itself out. A 2-0 win with Harry taking the man of the match honours. Arsenal beat Brentford so it was as you were. Next up was another home tie and a game against Newcastle. There were always memorable games between the two sides but Liverpool were hoping that this time it would be as uneventful and mundane as possible. As long as they won. Newcastle were also a side at the wrong end of the table. Only out of the relegation zone on goal difference, they would be fighting and scraping for everything in their bid to stay up. The same XI that started the Huddersfield game started this one also. And they did exactly as they did in the last game. Harry bagging in exactly the same minute, the 7th minute with a back post header. The only difference this time was that it was the first goal not the second. That was where the similarities ended for now though as firstly, Ivan Garcia Ramos went off injured and less than 60 seconds later, as Liverpool reorganised, Newcastle equalised. Liverpool were labouring, they got to half time without creating another chance. They were struggling with the pressure of the home crowd on their backs. Ian Holloway knew he had to make a change and that he did on 57 minutes. Ade Scott, the centre half was taken off and Ramon Azeez, central midfielder, brought on. This gave them an extra man in the middle and this was all the difference. They took control of the game there and made it count. Harry scored a second on 65 minutes with a left foot shot and he completed the perfect hat trick on 71 minutes as he broke the offside trap, rounded the keeper and passed it right footed into the empty net. Instantly, Holloway reversed the sub he had made before Alex Winter was removed from central midfield to be replaced by Dennis Castle a centre back. They had done what they needed. The two goal cushion, there was no coming back from and the win was sewn up. Liverpool were now top of the table by two points but Arsenal now had two games in hand.